Welcome back to our fourth episode of Know Your Bass Player and today we’re talking the Jason Newsted Bass Rig Rundown formerly of Metallica. Jason contributed to the core years of Metallica after much growing pain. When he eventually was given creative space and created such fan favourites such as “My Friend of Misery, “King Nothing” and “Wherever I May Roam” to name a few. Which is ESP’s take on a Fender Precision Jazz. Surveyors these days are sold under the more affordable option of LTD Surveyors*. The same Surveyor bass is again seen on the album cover of Garage Days Re-Revisited EP which was recored in anticipation of the Monsters of Rock festival in August 1987. James and Kirk were endorsed by ESP and the offer presumably was extended to Jason too, hence the use of the Horizon. The following year in 1988 recording for And justice for all began. Recording engineer Flemming Rasmussen commented in an issue of Sound on Sound that Jason used a 5 string Wal bass on the album. Following live festivals such as Monsters of Rock 1988, Jason was seen using a combination of 4 and 5 string Wals and the ESP 5 string Horizon. 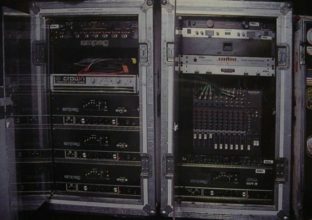 These basses remained in his rig until August 1989, where on the “Binge and Purge” DVD Seattle show he was using Alembic basses. The Jason Newsted Bass Rig had a big history with Alembic basses and gave way to a lot of experimenting. He had basses made to address many issues he was experiencing whilst playing. According to Alembic he had at least 13 basses constructed with custom options. Ranging from different wood types, electronics or changing the contour of the body. He used the following models to experiment with. These Alembic basses were played live between 1989 and 1992 spanning the length of the Black Albums’ – Wherever we roam tour. “I pick the wood and everything. I also design the pickup configuration. Alembic has built my last 10 basses from my specs. In October 1990 the band started work on the Black Album. Contrary to the previous tour, Jason primary used a 1981 Spector NS-2 to record with. As well as up to 25 different basses in all, Including 6, 10 and 12 string bass which were used for specific parts. These basses featured black oil finish, piezo pickup option, fiber optic side markers and carved body contours. Recording of Load and Reload begun in 96 and 97 respectively and in an interview with Bass Player Magazine 1996. Jason again stated he used the NS-2 and a few other instruments to record. This tour showed Jason back on stage with the new addition of Sadowsky basses. Jason begun a very lucrative relationship with Roger Sadowsky in which he made at least 20 custom basses. Many of which are seen in the 1997 live show Cunning Stunts. The Sadowsky basses boil down to either a 4 or 5 string PJ or JJ pickup configuration. Jason has stated in interviews that he liked these basses because they are a “Turbo Fender” and the tone sounds just like his 1958 Precision bass but with a little more juice. The Sadowsky basses were used to record Garage Inc. In 1998 and played on the Symphony and Metallica show in 1999. Jason Newsted bass rig consisted of Ampeg heads and cabinets throughout Metallica. This was plugged into a 1×15 Ampeg speaker* and 4×12 Mesa Boogie cabinet. SVT II’s (2) are no longer manufactured, the Ampeg SVT 3* took its place. These go on to power two Ampeg SVT 8×10 cabinets*. Jason’s recording setup has had some subtle changes over the years including the use of a few other Ampeg head models. Can you describe that recording domain? We used three rooms to record the bass for Load. … the “crunch” room–had an old Gibson Skylark guitar amp, a 9-volt Marshall practice amp, and a MESA/Boogie 1×15 combo. The “meat” room … had two old Ampeg SVT cabinets with no horns, a ’74 SVT head, and three MESA/Boogie 15s with SWR heads. The low-end room–which I shared with James’s “Tent of Doom”–had two MESA/Boogie 15s and a Fender folded-horn 1×18 cabinet that goes with the 400 PS Bass head. A solid-state Marshall 7400 head ran the cabs in the low room. I also used an Evil Twin tube DI to go into the board. All of that was blended together for most of the songs, and I stepped on different pedals. Jason’s strings have always been made by LaBella and he used Hard Rockin’ Steels commonly known as Stainless Steel Round Wound. Designed to be very flexible string and higher tension than others. Jason swapped the pickups in his original basses the Warmoth and the BC Rich with an EMG pickup set. Citing EMG as a standard, fundamental for a metal sound. Jason also changed the stock pickups in some of his Sadowsky basses to the same EMG configuration. I’ll see you on the next Know Your Bass Player where we conclude our first series. After that we open the floor to viewer suggestions. So get yours in now as we already have a few submitted. Continue watching some of our most recent videos. *Some of the links above are affiliate links, which means that if you choose to make a purchase from that site, we will earn a commission. As a result this commission comes at no additional cost to you and helps pay for the costs of our site our and video series.